In a fall drenched with music games like The Beatles Rock Band, Guitar Hero 5, Band Hero, and others - one game has managed to stand out by attempting something different. 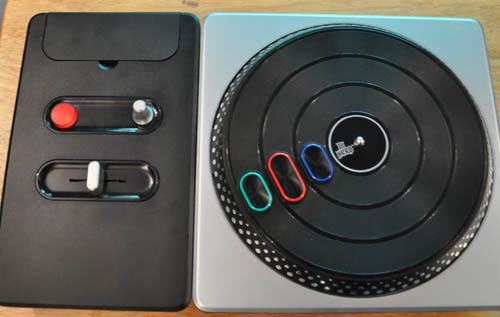 DJ Hero has broken away from the rock and guitar genre, instead focusing on the mixing of different songs and beats to create unique music. The DJ's instruments are the turntable, his headphones, and a microphone; and while yours may be plastic it's nice to be able to shape the music on the screen. 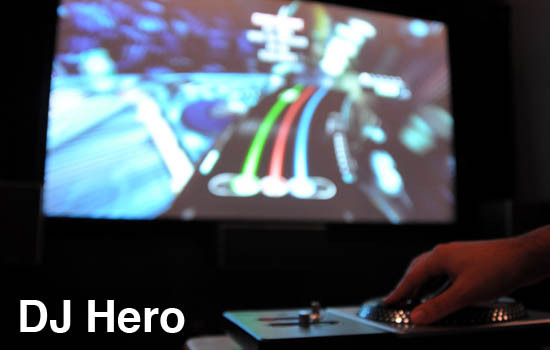 As a veteran of music games you may come into DJ Hero thinking you can skip the tutorial, but that isn't advised. While the game shares its roots with other games in the genre, gameplay wise there's a lot of new things to learn. You'll still be tapping buttons as notes come down three tracks on the screen, but added to the mix are scratches, fades, freestyles and more. Scratch patterns may be freestyle or specific, asking the DJ to either scratch up or down by spinning the turntable back and forth. Crossfades follow the outside tracks either left or right mixing in the appropriate song either less or more. The slider has a little dead zone in the center that clicks to let you know you've gotten back to balanced, but it's very tempting to just slam the slider back and forth missing the tracks. Freestyle samples, which can be loaded before a song, allow DJs to drop in custom sounds and voices into a song. There's a few ways to add bonus points to your score, either by hitting Euphoria notes in succession to build up a meter, or by building up note streaks and earning rewinds. Euphoria acts like Star Power in other music games, and can be activated by pressing a button that lights up the turn table to double your multiplier. A rewind is activated by spinning the turntable backwards, and it does exactly what it sounds like - rewinds the song. You'll get a short double multiplier in doing so. The trick here is to rewind when there's a lot of notes to play for maximum points. I found the rewinds, while fun to do, ruined the pace of some of the songs. While there really isn't a career mode in DJ Hero, there is an order to the games progression as you play through different sets of songs. Each song is worth up to five stars, and stars are used to unlock DJs, accessories for your DJ, and venues to party it up in. With almost 100 songs at your disposal, that's a lot of stars to earn and a lot of unlockables to get. 100 songs sounds like a lot, and it is, but it's also a bit of a misconception. The game is filled with 100 mixes of songs, but the same song is uses multiple times. Thankfully the real life DJs that created the mixes have done a great job of making each mix feel unique, and rarely will it FEEL like you are playing the same song. With the likes of Daft Punk, DJ Jazzy Jeff, Grand Master Flash and others, there's a ton of talent behind these songs and mixes.